Legend of Love by Lisa Kessler is the second book in the Muse Chronicles series. If I were to make a comparison with the previous book. I would have to say this my favourite. 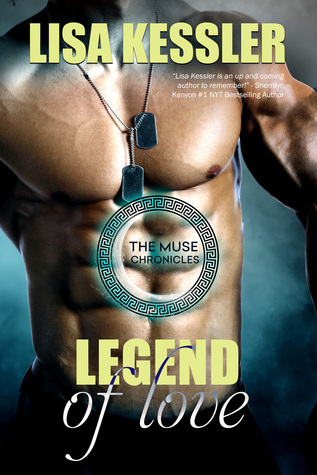 Legend of Love is Callie O’Connor’s story. Callie is a woman of adventure, but when the muse epic poetry came alive within her, her life was never the same. To escape the effects of what her muse does to her she moved across the country and took a job as a civilian psychologist for the Navy while leading her sister muses in their quest to reopen the Theatre of the Muses. She is determined to stay single and made a pact to remain dateless and single until the theatre was completed. However, she never counted on meeting Hunter Armstrong, a Navy Seal, who is determined to break down her barriers and do his best to protect her from the evil at hand. The story picked up from where book one left off. The threat to the muses is not over. Instead of weakening, it intensified. The Order of the Titans are determined to put an end the inspiration of this generation, that means killing the muses, and Callie is on their radar. The story began on a strong note and maintained that pace to the end. We learn more about The Order of the Titans. Based on their actions, I would say they are fanatics, which makes them deadly. However, I found them to be inefficient in their quest to kill the muses. The theme that intrigued me most about this series was how Greek mythology was incorporated with present day events. The intensity of the action scenes kept me glued to the pages. My eagerness to discover how the events would unfold kept me turning the pages. I loved how the romance unfolded. Callie and Hunters’ connection was instantaneous, which I expected due to the legend surrounding the guardian and his muse. However, the romance developed at a pace that was befitting the characters. I appreciated their attempts at getting to know each other before rushing into the carnal aspect of their relationship. There was a particular scene which I found emotional. Reading that scene made me feel sad but placed a smile on my face. Character development was well executed. Callie’s past is riddled with secrets and as a result, she is scared to get close to Hunter. She believes she would cause heartbreak for any man she gets close to and so getting involved with Hunter was out of the question. Hunter is a troubled soul. He joined the military to help his family. However, his duty to his country prevented him from sharing in important events in their lives. Added to that, he is struggling with the guilt of leaving behind a team member during his last deployment. Meeting Callie would bring changes to his life in ways he never anticipated. I loved Callie and Hunter together. He helped her to move past her fears and seize her destiny. With Hunter, she learnt she need not fear who she had become. She helped him to see that he need not feel guilty about his family or his friend. I thought this was a great addition to the series. I can’t wait to see what next the author has in store for this series.